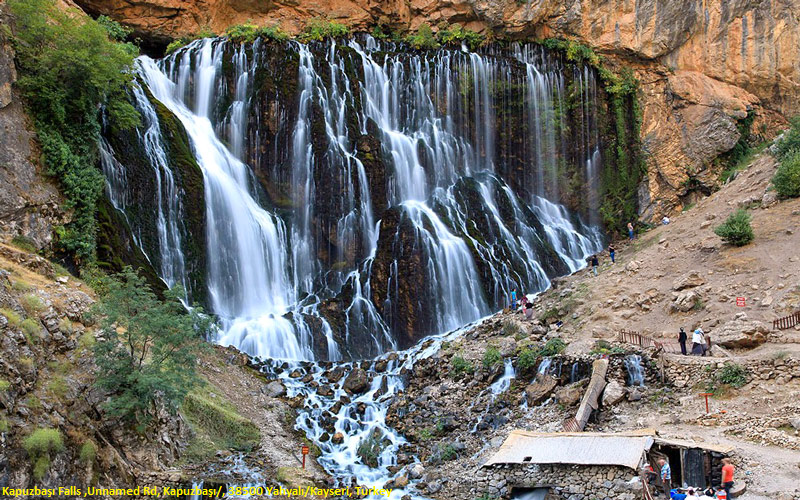 Kapuzbaşı Waterfalls are spring waterfalls spilling out of rocks, spilling from 30-76 meters high with very large water flow, and also flowing continuously in summer and winter months, in a 500 square meter area, consisting of 7 waterfalls. Kapuzbaşı waterfalls, the second highest waterfall in the world, are made up of seven waterfalls spewing out of a rocky mountain in Kayseri province, north of Adana. The waterfalls rise from the eastern and southern slopes of the hill near Kapuzbasi Village and are poured into the Suarısı with a great noise and then confused with the river of Zamantı. Kapuzbaşı Falls, 40 km from Adana's Aladağ district, are located within the boundaries of the Yahyalı district of Kayseri within the framework of Aladağlar National Park. Located in the eastern part of the Demirkazik mountain on the Central Taurus Mountains is in Hacer forests covering 18.000 km2 area. The transportation to the Kapuzbasi Falls, located at Ensenin Hill in the north of Büyükyakır Mahallesi of Yahyalı, is provided by two separate roads, 55-65 km away from Yahyalı, after reaching Yahyalı by way of Kayseri-Develi. One of the routes is the 65 km long Yahyil-Dikme-Çamlıca-Ulupınar-Kapuzbaşı route. The other is a 55 km long road following Yahyalı-Dikme-Delialikuşağı-Yeşilköy-Balcicakırı-Kapuzbaşı route.